What Is an N Router? The "N" is taken from the "802.11n" standard developed by the Institute of Electrical and Electronics Engineers (IEEE), which specifies how all Wi-Fi equipment should communicate, so that devices will work with each other. This standardization allows consumers to mix and match equipment from many manufacturers. It's why, for example, your laptop's Belkin WiFi adapter communicates with the Cisco WiFi router in your favorite coffee shop. Standardization is a good thing for consumers and for network designers. The "N" version of the 802.11 standard is the latest and greatest with improvements in wireless communications. The 802.11 standard originated in 1997 and has gone through six major revisions. "N" is the latest, ratified in 2009, and it incorporates the biggest improvements yet. First of all, wireless N devices transmit data 2-4 times as fast as the fastest previous "G" standard. The 802.11g devices operate at up to 54 Mbps, while 802.11n gear runs at 50 to 144 Mbps depending upon the enhanced features enabled and the distance between wireless sender and receiver. Some users have reported actual speeds up to 200 Mbps. Second, N operates on both radio frequency bands used by WiFi networks: 2.4 Ghz and 5 Ghz. This will help relieve interference between N devices in densely populated areas. If several neighboring WiFi devices are on the 2.4 Ghz band, you can switch to the less crowded 5 Ghz band. Also, 2.4 Ghz devices have longer transmission ranges, so if you need more distance between your N router and your WiFi adapter you can switch to the lower frequency. The N protocol has one other benefit in addition to speed, which is increased wireless range. Wireless G devices are able to communicate well within a range of about 100 feet (from the router to the adapter). The N devices up the ante to over 220 feet. The N standard is backwardly compatible with earlier 802.11 standards, even earlier standards that are not compatible with each other. The 802.11g standard is not compatible with the legacy 802.11a standard because the two standards operate on different frequencies. But the N standard can operate on both 2.4 Ghz and 5 Ghz frequencies, even both simultaneously. Therefore it can be compatible even with standards that are incompatible with each other. Multiple Input-Multiple Output (MIMO) technology is what enables the dramatic speed increase and the compatibility with mutually incompatible standards. The N standard employs two pairs of wireless antennas to send parallel streams of data between router and adapter (client). It's like a two-lane highway versus a one-lane road; more traffic can move along in the same amount of time. Should You Upgrade to Wireless N? The N standard increases the effective speed of wireless networking and eliminates compatibility problems that have plagued mixed 802.11 A, B and G networks. It also doubles the range of wireless routers. Bear in mind, however, that an N router capable of 144 Mbps won't help if you have a slower (and very common) G adapter in your computer. And similarly, there's no point in upgrading to an N adapter if you have a G router. To get the boost in speed and range that N wireless offers, you need N on both sides of the wireless communication path. But here's something else to keep in mind… Most "high speed" cable Internet connections offer download speeds of 3-5 Mbit/sec. DSL speeds are about half that. If you're lucky enough to have a fiber optic connection, such as Verizon FIOS or AT&T's U-verse, then you might get 10 or even 20 Mbit/sec speeds. And good old 802.11g operates at 54 Mbits/sec. So... if your G wireless gear is already quite a bit faster than your incoming Internet pipe, upgrading your wireless router and adapter to N isn't going to do anything for your Internet speeds. It may help if you transfer large files between computers on your home network, but how common is that? The most compelling reason, I think, to move up to an N router is the expanded range. If you're getting a lousy wireless signal out in the garage, the hammock or in the pool, then upgrading to an N router in the house and N adapter in your laptop should help. Most recent comments on "Wireless N Routers"
I just bought a Sony BDP-N460 Blu-ray Disc/ DVD Player and the sales staff recommended that I also purchase a Wireless Router to connect the Blu-ray player to the internet so as to be able to get hardware / software upgrades and NETFLIX, YouTube, etc. However, I get conflicting recommendations what to buy. I have a Toshiba Satellite P105-S6124 Lab Top computer (Windows XP) that is, during the winter months in California, connected to the Internet by a Modem from the Time Warner Cable Company (Road Runner service) with a speed of 100.0 Mbps. During the summer months, in B.C. Canada, the same lab top is connected to the Internet by way of a secure wireless Network connection (no router but a local Internet provider) with a speed of 50 Mbps. In California we have a JVC HD Television model HD-52G786 and in Canada we have a Sony HD Bravia LCD TV Model # KDL-40S-4100. Both TV's have HDMI connections. In California and B.C. Canada we have Yamaha AV Receivers but they have no HDMI input/outputs and the HDMI connections are made to the TV’s with the sound using the Digital out of the AV Receivers. etc. what do I really need ? Reindeer, you appear to be a bit confused. HDMI carries the digital video and sound for your TV. HDMI has nothing to do with networking. Networking uses either a wired connection, usually via Ethernet, or wireless, like 802.11G or 802.11N. You need to connect your BDP-N460 via a local network to the internet via your local ISP in order to stream from NetFlix, or any other supported provider. The BDP-N460 appears to only have an Ethernet connection for networking. Therefore, you need to connect this Ethernet port to your local ISP in some manner. Your ISP typically provides a single network connection on the cable modem, and usually that's Ethernet (Ethernet is faster than USB anyway, so that's what you should use). In order to share that Ethernet connection with other devices, you need a router. A router splits the one Ethernet into multiple Ethernet connection, typically 4. If your BDP-N460 is close enough to your router, you can use an Ethernet cable to connect them. This is by far the simplest solution. If the BDP-N460 is too far from your router to run a cable, then you'll need to go wireless. However, this is not simple. This requires a wireless router next to your cable modem, and another wireless bridge next to your BDP-N460. This configuration is not simple. If you need to go this route, I recommend you pay someone local to set this up for you. Is the "N" connection any more reliable than the "G" version? For me, that's far more important than the overall speed. When I was trying to set up a wireless link to my second PC, I tried both "G" and "B"; even with both units were in the same room, around 5 feet apart, they would loose connection briefly every 30 to 60 minutes -- just enough to kill any large-file downloads that I was doing. Also they would not automatically reconnect; I had to do some button-pushing to get it to try again. My dual-band a/b/g wireless router just died, which leaves me with a few computers that are equipped with wireless a network cards. Will a dual-band b/g/n wireless router connect with my wireless a network cards at 5 Mhz, even though the new router says nothing about wireless a? Are 802.11N routers more secure than 802.11G? I have wireless security cameras 2.4 signal and they have worked well. However after I installed a basic D Link router to my computer with the same signal I have a very wavy picture on my wireless camera receivers or tv sets. I did purchase a D link that has both the 2.4 and 5 signal but haven't hooked it up yet. Will this correct my problem or do you have a better idea? But the directions don't coincide with the equipment in my house. I think it's only for people who don't have wifi. I have a question to ask as I looked and didn't find an answer or soultion to my problem. I have a Compaq Presario desktop computer and a laptop and I wanted to connect my Linksys WRT160N wireless router so I can use my laptop anywhere in the home. Here is my problem. Connecting a wireless router is very confussing to me and for some reason it doesn't make sense to me therefore; I cannot connect the router correctly. 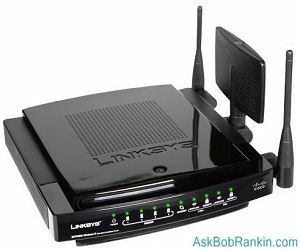 Is there a step by step guide with pictures or video that shows how to connect a wireless router to their desktop and laptop that I can follow to be able to set up a Linksys wireless router? Thank you very much for any help at all as this is very confussing to me and I just don't get it?